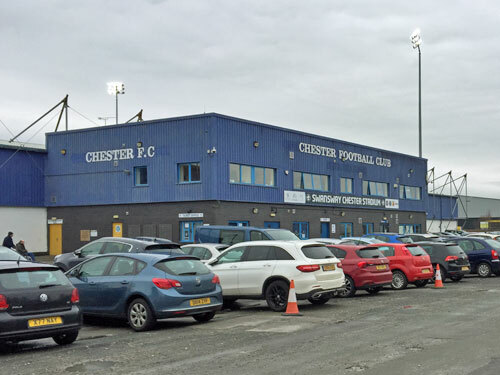 The odd thing about Chester FC, an English club in football's fifth tier, is that they play in Wales. Not all of Chester is in England. The Welsh border swings in round the Dee estuary, crossing the river a mile downstream from the city centre, then bending west again. For centuries the boundary passed through saltmarsh and farmland, well away from any commercial activity, but suburbanisation nudged the city outwards, beyond its famous walls. In particular a huge trading estate grew up to the west, a warren of car dealers and builder merchants, and nudged inexorably closer to the country nextdoor. 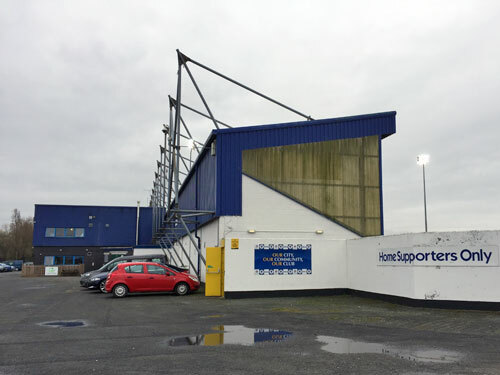 Chester City FC used to play at Sealand Road, an ageing stadium at the top of Bumpers Lane. But in 1990 new owners took over and announced plans to redevelop the site as a retail park, like they do, and fans were forced to groundshare with distant Macclesfield for two years until a replacement could be built. The chosen site was farmland halfway down Bumpers Lane, slap bang on the border between England and Wales, hence the team's unique geographical quirk. At the new Deva Stadium the entire pitch and all four stands are in Wales. 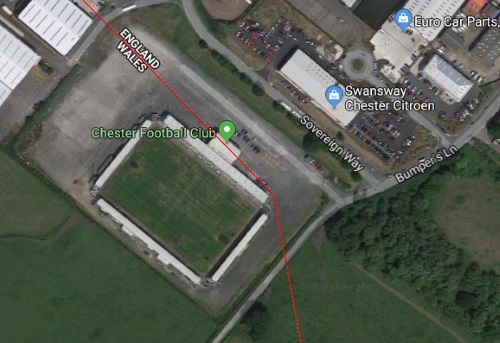 But the admin block stuck to the front nudges out just far enough to reach England, hence the main entrance isn't in Wales, hence the stadium is officially English. I quite liked the idea of walking from Chester to Wales, so set off on a short trek up the Sealand Road. The site of the former stadium is now a Poundland and TX Maxx and, for now at least, a Maplin. Bumpers Lane is unrecognisable as the dead end dirttrack to the Dee it once was, lined by innumerable low-res warehouses. All the family-friendly chains and big supermarkets are at the top end, then come the retail sheds where Dads like to spend their weekend afternoons, and finally the council tip. And all the time the floodlights at the very far end were growing closer... and hang on, why were they blazing? Deva Stadium is normally a silent void surrounded by an empty car park - ideal conditions for a spot of psychogeographical flaneury. On this occasion, however, the car park was full, and excitable shouts from within confirmed that a match was in progress. What's more a considerable number of police were present, far more than I'd expect to find at a National League match, and I realised I'd now have to carry out my stadium reconnaissance under their full scrutiny. Worst of all they'd parked their dog vans at the very point where Bumpers Lane reverts to a farm track and heads into Wales, and I no longer fancied walking past the barking to explore. Dammit. Always do your research before you visit, especially if your plans include a football stadium on a Saturday afternoon. I wandered through the potholed car park to the front of the offices, where a club minion was shifting traffic cones in readiness for the end of the match. He eyed me suspiciously as a I took a photo of the doors to the bar and shop, made brief conversational contact (in English, not Welsh), then wandered off to shift some more. I took the opportunity to step into Wales. The border slants across the car park, with the disabled spaces against the back of the main stand a few yards on the Welsh side. But there were absolutely no signs anywhere to give the game away, and unless I'd checked on a map beforehand I'd never have known. A roar went up from inside as the match reached fever pitch. I guessed from the noise level that the home side must have done something impressive, but not quite as impressive as scoring a goal. The gate at the back of the stand flapped open and a spectator emerged, walked round the side of the stadium, knocked, and popped back in. I considered trying the same and becoming spectator number 3104, but thought better of it, and continued round into the Welsh arm of the car park. The outsides of prefab football stadia alas aren't the most exciting of places, in this case a whitewashed wall with four doors, intermittently broken by adverts for the village chemist who sponsored the family stand. A much longer roar erupted from the far side, sustained for celebratory length, which I assumed must be bad news for the home team. Sure enough a trickle of supporters appeared at the gates, heading silently for their cars parked in the adjacent country. One was a dad leading his young daughter, one of whom sounded sorry not to be staying until the final whistle. I finally checked on my phone and discovered that yes, Tranmere Rovers had just scored a goal. They're from just up the Wirral, making this a local derby, which suddenly explained the presence of police in large numbers. What's more that goal they'd just scored had condemned Chester to relegation, and a purgatorial season in the National League North now awaits. What a time to have turned up. It's particularly gutting for supporters, whose team has been climbing the non-league echelons since the owners went bust in 2010, and who'd finally got back to where they were when they were kicked out. For 2018/19 they'll be one rung down. 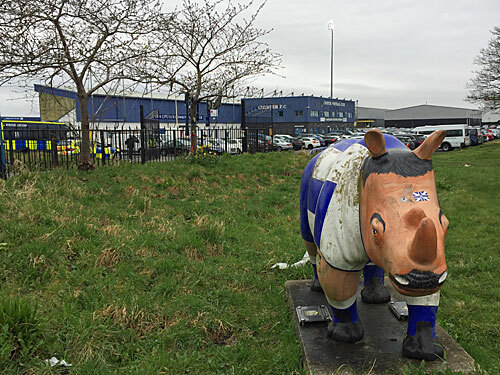 The replacement club is known as Chester rather than Chester City, and now has no connection to the bankrupt consortium who flogged off the original ground. 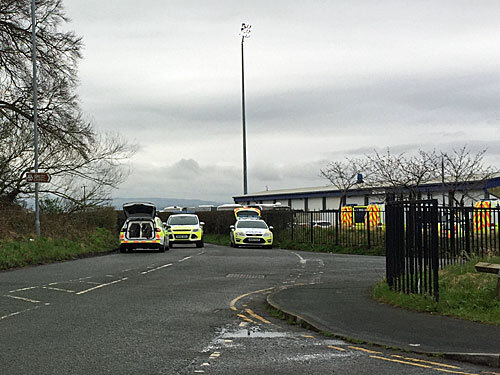 Further perambulation proved impractical, under the gaze of dozens of police officers with nobody else to look at, plus there's not much to be gained from following an invisible line across a packed car park. My planned escape down Bumpers Lane was still obstructed by trained canines, but I reassured myself that the brief footpath I'd planned to follow down to the Dee was probably a quagmire and I'd had a lucky escape. My visit to the start of the Wales Coast Path will have to wait. In the meantime I'm pleased to have visited the English football stadium that's actually in Wales, just as Nuneaton Town, Darlington and Southport will be doing next season.